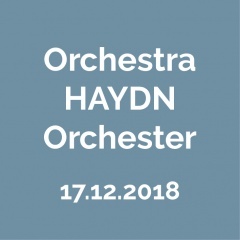 The Haydn Orchestra, recognized as a concert institution by the Italian Ministry of Culture/Tourism, was founded in 1960 by the provincial government and local authorities of Trento and Bolzano. It has performed in principal Italian concert venues and has participated in numerous international festivals, including the Haydn Festival in Esterháza, the Bregenz Festival, the Arturo Benedetti Michelangeli Festival in Brescia and Bergamo, the Mozart Festival in Rovereto, the Settimane musicali Gustav Mahler in Dobbiaco, the Antonio Pedrotti Competition for Conductors in Trento, the Tiroler Festpiele in Erl and the Ferruccio Busoni Piano Competition in Bolzano. The orchestra has toured in the United States, in Austria, Germany, Hungary, the Netherlands, and in Switzerland. 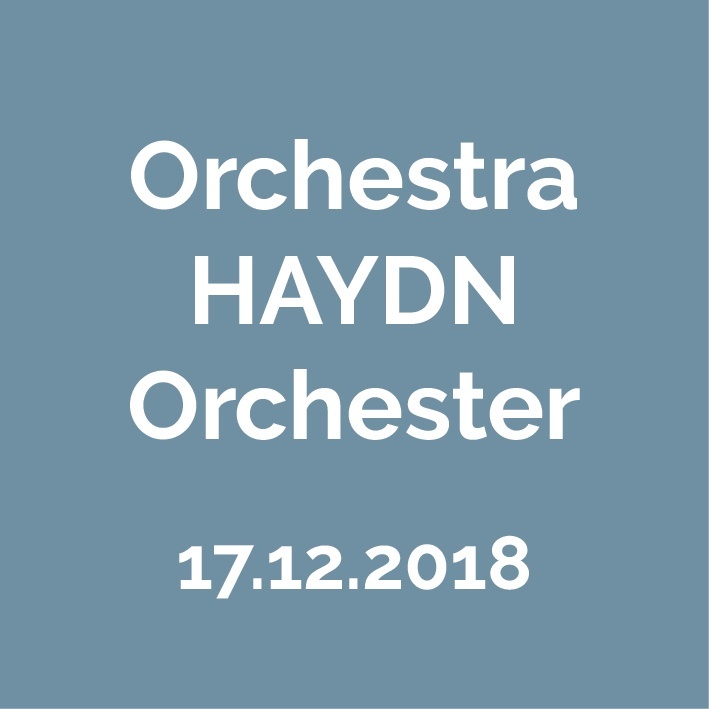 In its nearly fifty-year long history, the Haydn Orchestra has performed a vast number of works across all musical genres, ranging from Baroque to contemporary composers, including Dallapiccola, Nono, Berio and Donatoni, who entrusted it with the first performance of their works. It has especially focused on an often neglected repertoire, also promoting the rediscovery of precious long-forgotten manuscripts, such as the Dixit Dominus by Domenico Cimarosa, performed for the first time in the modern era at the Thirtieth Festival of Sacred Music in Bolzano/Trento, or the Messe solennelle by Hector Berlioz, of which it gave the first modern-day performance. The orchestra has appeared with many great conductors, among them Claudio Abbado and Riccardo Muti, and collaborated with distinguished soloists. In 2003 Gustav Kuhn was appointed artistic director of the orchestra. Under his direction the Haydn Orchestra performed all nine Beethoven symphonies in the season 2005/06. This cycle has also been recorded by col legno classics and was a great success among critics and public. In December, 2007, this success was confirmed in Salzburg, where the orchestra performed the symphonies again. In summer 2006 the Haydn Orchestra debuted with Torvaldo e Dorliska at the 27th Rossini Opera Festival in Pesaro, where it was invited again in 2007 to perform within the productions of La gazza ladra, which was awarded with the French Diapason d’or prize, the Turco in Italia, Edipo a Colono and Le nozze di Teti e Peleo. In August, 2008, the Haydn Orchestra performed Maometto II and L’equivoco stravagante in Pesaro while in September it inaugurated the 63rd Sagra Musicale Umbra Festival in Perugia with Beethoven’s Missa solemnis, conducted by Gustav Kuhn. In December, 2008, the Orchestra was again invited to Salzburg to perform the four Brahms symphonies, the Missa solemnis and Beethoven’s Ninth Symphony at the Mozarteum, conducted by Gustav Kuhn.In August, 2009, the Orchestra performed La scala di seta and Il viaggio a Reims in Pesaro during the 30th Rossini Opera Festival.The Haydn Orchestra has a busy recording schedule for Agorá, Arts, col legno classics, cpo, Dynamic, Multigram, Naxos, RCA, Universal, VMC Classics and Zecchini, and has also appeared several times on RAI (the Italian State Broadcasting Corporation), both the radio and the TV channels.